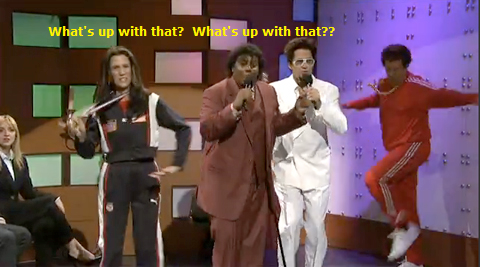 This might be the start of a consistent series because I have so many things I saw 'what's up with that?' to. Today though, I am asking - what is up with those sign spinners on the side of the road? More specifically, the ones on the roads I drive on. I totally get it in most circumstances. Advertising a sale? Sure! Letting the public know that you pay cash for gold? Okay. Going out of business sale and everything is 50-70% off? Absolutely. You can't really advertise that on your outdoor signage. What I don't get at all are the ones for apartment complexes. Do people really stop in and lease a place to live based on someone spinning a sign on the side of the road? I mean, I am glad these people have jobs and such, but is this really a good use of money/time? I suppose the investment in such advertising is very small, but still. I can't wrap my head around it. I feel like I should be their target customer since I am a renter who drives this route by their place, but I think it is pointless (though sometimes entertaining when the spinner really gets into it). Plus, advertising to the entire street, I wonder what percentage of people are even A. Renters and B. Looking to move. It seems like it would be practically no one. Does anyone else find this practice weird? I love him. 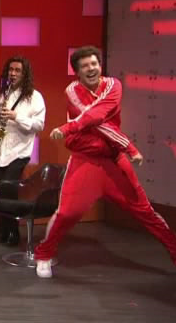 Dance, red track suit guy! I love watching the sign spinners. Especially when they drop the signs or knock themselves in the face with the signs, haha! Is that mean? I don't know why I find it hilarious, but for some reason I do. But I agree. I don't get it either for the apartments. I have just recently started seeing those pop up all over our town too. Weird. I watched a guy playing air guitar I mean sign guitar with his gigantic arrow sign - no earbuds in. That's weird. They're all weird! What's probably the most weird - there has to be a reason that within the last year or two sign spinning has become so popular, it must work right? Not on me though, if a company has a sign spinner I immediately think they are a-holes for expecting someone to stand out on a street corner making a fool of themselves. At least give them a mask so they don't have to reveal their identity.